An excellent demonstration of Italian design, O'REA boasts a highly wooden paneled interior and famous designers fabrics. 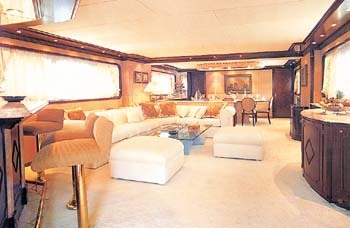 On being invited aboard, one is immediately aware of the enormous volume and spacious areas. The main salon, the full bar and the dining salon have each been intelligently laid-out to offer several independent and cozy seating arrangements. 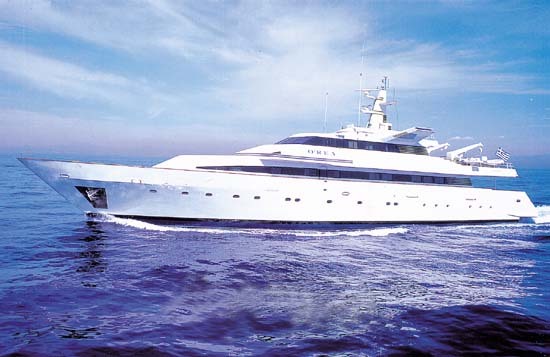 O'REA accommodates twelve guests, in three double and three twin cabins designed to satisfy the most demanding requests for privacy and luxury. The water sports equipment and exterior recreation areas have been cleverly kept apart to allow the maximum amount of space available to the guests for their enjoyment. 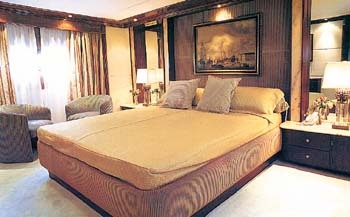 ACCOMMODATION : Three double bedded staterooms each with en suite facilities. 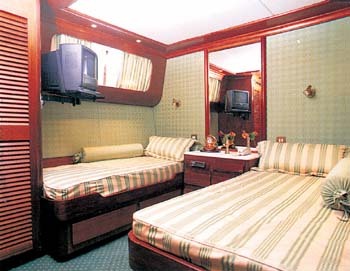 Three twin bedded cabins all with private facilities. Ski, nautique tender with outboard engine 70 HP.